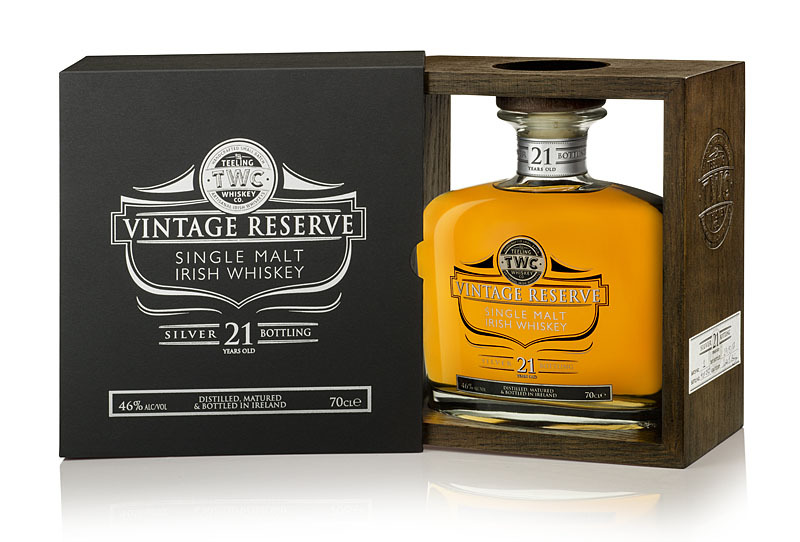 The Teeling Whiskey Company today launched it's Silver Reserve 21 Year Old Single Malt. This is the first in a series of three small batch releases containing some of the oldest single malt Irish whiskey ever bottled. Still to come are a 25-year old ("Gold") and a 30-year old ("Platinum"). It's a double-distilled Irish single malt, but you shouldn't draw any conclusion from that as to where, precisely, it was made. It was distilled in 1991 and matured first in bourbon casks. It was then allowed to marry for 10 months in Sauternes casks (Sauternes is a sweet French white wine) before bottling at 46%. It is the first ever Irish whiskey finished in Sauternes. There are only 5,000 bottles in this limited release and it will sell for about €150 (USD$185 / GBP£125). It's initially available in Ireland at Dublin Airport, the Celtic Whiskey Shop and quality independent off licences. It will then be rolled out to international markets such as the UK, Canada, Belgium, Germany and France.